Life is fast and you are just as active. You have all the world to worry about so why put so much work into caring for your skin with complicated and inconvenient regimens? Lynex has your skin needs covered with our hybrid (external and internal) nourishing approach. UV protection works on the topical skin. Skin deep, it is the moisturizing, toning and anti-aging agents that goes to work for you. We’ve heard it all. Active, confident, demanding, perfection. That describes you right? Of course it does! Any one of those attributes can describe you whether you are young or not as young. But what have in common is the lack of time. If you have the ability to slow down aging, wouldn’t you want to start it now? The youth complexion you have now is the complexion you want to keep. Young, tone and radiant! With the dormancy effects on your skin cells that can keep you looking young for years to come, why wait till your 30s and 40s? You are demanding of nothing less than perfection. Image is everything. 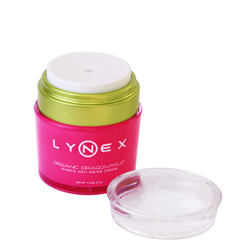 In the daytime, Lynex keeps your face tone and radiant. With the brightening effects of our organic extracts, your face will gradually exhibit luminescence that people will notice. You are already radiant and now your face really shows it! What’s more, the inherent ability from the tomato extracts will guard your skin from the everyday casual UV exposure. There’s no need for second thought here. UV protection is already at work for you, providing a light protection barrier from harmful rays for your sensitive skin. Skin need to stay hydrated? The hybrid cream nourishes your face with what it needs but with the added dual benefit of anti-aging! You might say the hybrid cream is action packed that keeps up with your active lifestyle. Any other approach other than safeguarding time for your skin’s youth is just fixing it after the fact! You are living young with new expectations. We have answered. Lynex puts time on your side because your time to shine is now. Time is now. Forever.